We’ve had Icelandic Chickens now for almost four years. Every now and then I get this very interesting pattern, and it’s been really rare for me. 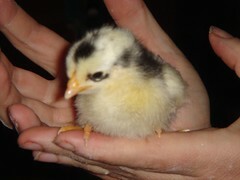 There was one in the first batch of eggs that we hatched from Lyle Behl. 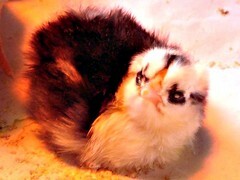 She looked so different from all of the other chicks, and I called her the masked one. She was my favorite not only because she was cute, but she was very curious and cuddly. 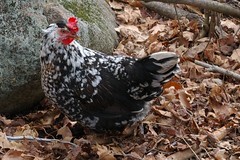 She grew up to be a gorgeous, sweet hen. She was the first to greet me when I’d come out in the morning and would often sit on my lap and let me pet her. Sadly, she was killed by the damn bear that got 20 of my birds when he ripped the door off of their coop, before we got the guardian dogs. Until now! This last hatch we did for a customer in Keene had two of the little darlings, and I told her that they’d be girls, I thought. I also told her how rare they were for me. But both them turned out to be boys! She can’t keep all the boys she got, of course, and we took the ones she didn’t want back. I’m going to keep these two and set up a mini little breeding group. If the two boys fight, I’ll have to get rid of one of them, but so far, they are best buddies. We’ll see if that lasts. 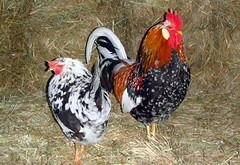 I have other roosters who get along fine with other boys. I think I have four or five of these girls at this point, including one with a black crest, something I haven’t ever seen on any of the birds until now. I’ve also got one with a black beak. I can’t wait to see what I get! 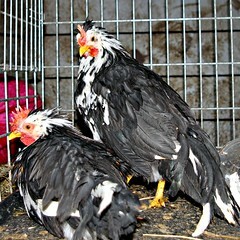 Your chickens are so beautiful, they make me want suburban chickens! Hey Lisa- have you ever used this for sexing eggs? I’ve done with pretty good results here- worth trying for sure.